The iColor Laser transfer printers from UniNet offer exceptional value and versatility. iColor transfer printers have the unique advantage of CMYK or CMYW toner sets. The CMYW toner set enables single-pass white toner printing and the CMYK set produces a full range of color and contrast. Print true black on white paper and media and composite color with white for opaque transfers on dark garments. The five toner carts makes them more flexible than most desktop printers in the garment decoration space. The self-weeding transfer media supports opaque color on dark garments and UniNet’s expertise in toner opens up extra applications like black light T-shirts and dye sublimation without ink. UniNet has taken one step farther with the new iColor 550. Maybe two or three steps further. 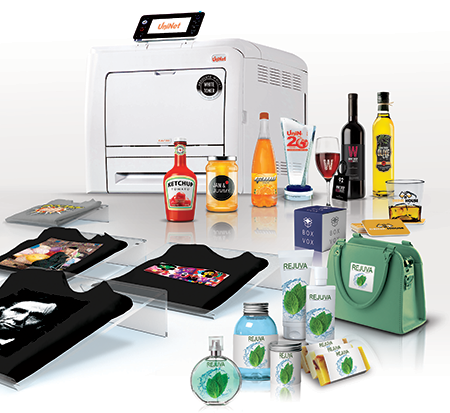 The iColor 550 laser transfer printer is based on a more advanced print engine and comes with smarter software. These developments empower you to create bigger and better transfers from a small desktop printer, check for The best used gadgets at Copysmart webpage where you can find great printers, copiers and other products.. The iColor 550 is an extremely versatile digital decoration solution. Print possibilities abound. managing large image files and prints at 1200 x 1200 dpi. Connectivity options are USB, Ethernet, or Wi-fi. As noted above, this is a desktop printer. That means the maximum paper size is 8.5” x 14”. Print speed is 35 ppm in color and monochrome and the duty cycle is up to 75,000 pages per month. The printer driver works in MAC and Windows OS, but to get the most out of it, you’ll need the bundled software, which runs in Windows only. The Toner: Like all UniNet iColor laser transfer solutions, it comes with a starter set of five toner cartridges. The toner and imaging drum are in one cartridge so it’s a little easier to configure than the older iColor printers. 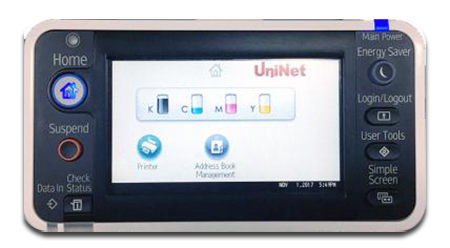 The 550 uses most of the same laser transfer media as the rest of the iColor series, but UniNet developed a special version of their 2-Step Standard media just for the new printer. The lo temp B Paper has an improved polymer coating that makes it easier to get consistent transfers on dark garments and produces better opacity on spot color white elements. You get the four process colors, Cyan Magenta, Yellow, and Black (CMYK) plus a fluorescent White toner cartridge. You can load four at a time and run in CMYK mode or CMYW mode. CMYK mode is for printing on standard paper. CMYK mode is also good for decorating white or pastel apparel with one-step self-weeding laser transfer paper. The inclusion of Black toner means you get full range of color and contrast so that your prints on paper and white apparel have more visual punch. CMYW mode combines composite color with Fluorescent white to support decorating dark apparel with opaque, vivid transfers. You can also print CMYW on transparent media like static cling film or waterslide decals for candles and other crafty applications. These variations are supported by the ability to print white under or over the CMY colors. Using the white toner in different positions in the printer is a unique iColor feature called color mapping that is supported by the bundled software. The combination of five toner cartridges and color mapping make all of the iColor printers extremely versatile. And it gets better. SmartCUT enables large transfers from small printers. 13″ x 19″ transfers are possible. Toner Options: The availability of special fluorescent and dye sublimation toner sets expands the envelope even farther. Fluorescent toner creates cool black light transfers that are spectacular in UV lighting. Sublimation toner enables iColor users to decorate all the shirts and substrates an inkjet sublimation system handles but at higher print speeds and lower costs. Sublimation toner can be used with standard copy paper. The sublimation process is generally easier and more consistent than using hard surface laser transfer paper. This increases productivity for hard surface decoration. And it gets better. The Software: The iColor 550 comes with new software that offers various benefits. The bundled ProRIP software offers the same basic functions as the iColor TransferRIP application in the iColor 500 and 600, but ProRIP simplifies the process so that it’s easier to get the desired results. Softening transfers is easier with the clever “Knock me black out” and stripes & holes features. These reduce toner cost and give your transfers a softer hand. ProRIP was built with custom ICC profiles for the iColor 550. The result is less vivid but more accurate color. ProRIP sets up queues for the various color configurations so it’s easy to manage the CMYK and two CMYW under-print and overprint options. ProRIP delivers more accurate color and simpler workflow, and is compatible with Windows XP, Vista, 7,8, and 10. And it gets better. There’s a new optional iColor 550 app called SmartCUT. SmartCUT enables you to separate an image into tiles that can be applied to a shirt in stages. This eliminates the limitations of a letter-sized desktop printer because you can create and apply transfers as large as the shirt. It’s not a perfect system and it does add time to the process, but it offers real benefits for customers who want to make big transfers on a small budget. For those who like to get the point, here’s a summary of the iColor 550 features and advantages boiled down to bullet points. The iColor 550 is based on a new print engine with features like a touch screen control panel for easy printer setup and use. The new engine is matched to improved 2-step laser transfer paper for better quality transfers on dark apparel. Like all iColor laser transfer solutions, the 550 comes with five toner cartridges, supporting CMYK or single-pass CMYW printing. The CMYW setup supports efficient printing of transfers for dark garment decoration. The CMYK toner set supports full color with rich true black on white paper and white or pastel garment decoration. 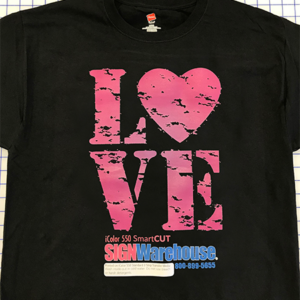 Color Mapping supports printing white under or over composite color for creation of t-shirt transfers on dark apparel and opaque images on clear media. Optional fluorescent and sublimation toner sets support black light t-shirt transfers and sublimating of all polyester and polymer-coated blanks. Toner sublimation offers advantages over sublimating with ink and can be easier to manage than hard surface laser transfer paper. The bundled ProRIP software offers more correct color via custom ICC profiles, supports color mapping, supports softening the transfers by breaking up the toner layers, and simplifies the entire process. It’s free with each iColor 550 and runs in every Windows OS since XP. 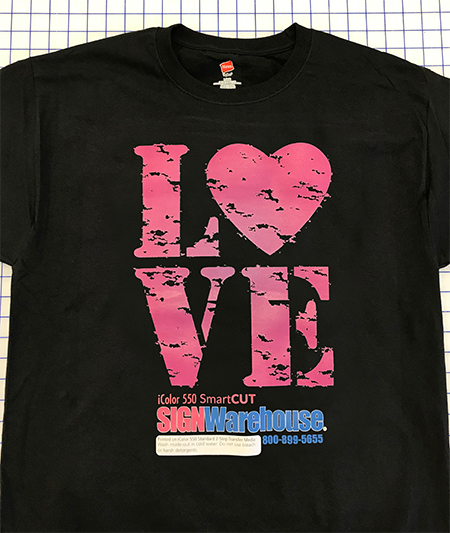 The optional SmartCUT software tiles image files so that you can decorate XXL shirts with 8.5” x 11” or 8.5” x 14” transfer media. The iColor 550 laser transfer printer is only $3,495.00 with the bundled ProRIP software. You also get a starter set of Cyan, Magenta, Yellow, Black and Fluorescent White toner cartridges, a QuickStart Guide, power cable, and USB cable. You’ll find all the User Manuals and support documents you need here on the iColor Series Downloads page on the Tech Support Blog. The SmartCUT software is a $299.00 option and can be purchased by phone. Give us a call at 800-899-5655 and ask for someone in the equipment group. It could be your next step toward an exciting, fun and profitable garment decoration business.